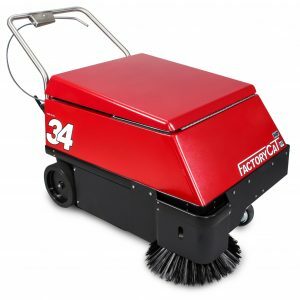 The Factory Cat Model 34 Walk-Behind Floor Sweeper is designed for any type of facility. Updated since the original, the 34 has been around for 25 years. 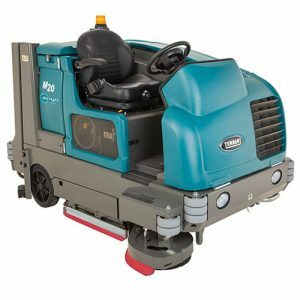 This machine is one of the most reliable sweepers that the industrial world has ever seen. Whether it’s dirt, plastic shavings, metal shavings, bolts and nuts, or sand, the Factory Cat 34 has been proven to achieve the sweeping needs that our customers have been looking for. This compact sweeper can last for 4 hours and a single charge and is designed to self-adjust when your broom wears. Call today for a FREE DEMONSTRATION! 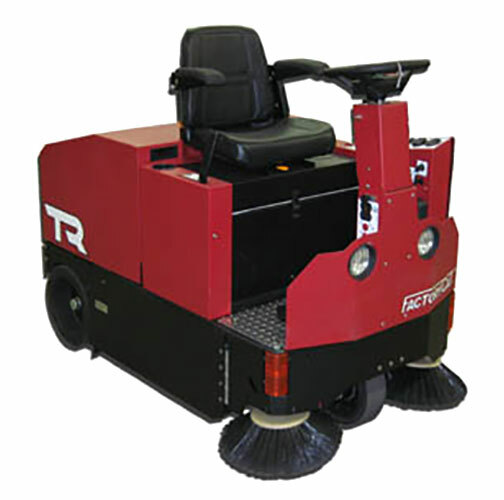 The Factory Cat TR Rider Floor Sweeper is a compact industrial sweeper designed to tackle any job the factory throws at it. This battery operated machine is a rider with superior maneuverability and an all-steel frame. Easy access to the slide out hopper and a simple control panel makes your sweeping quick and easy. A full charge on this machine will allow you enough operating power to last an entire shift! The Tennant 3640 Walk-Behind Sweeper is a durable and dependable sweeper that can clean floors in tough environments. This industrial floor sweeper offers dual side brushes for maximum cleaning and provides you with tool-free features to help make servicing easy. When you have a vacuum wand and the optional timed shaker for the panel filter, picking up dirt and debris is made simple. 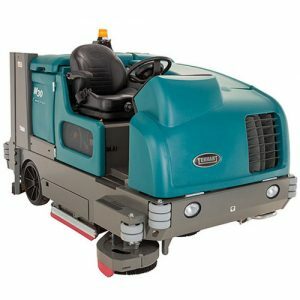 Tennant 6100 Rider Sweeper is a powerful sub-compact rider sweeper that is battery powered- making it incredibly quite during operations. Confidently manoeuvre through tight spaces and standard doorways with this machine, and access areas in your facility that most riders cannot reach. The 6100 is designed to tackle any hard surface or carpet that you find needs cleaning. 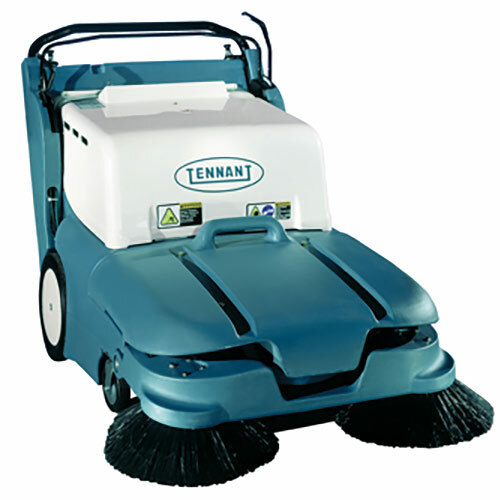 Keep your hands clean with the Tennant 6200 compact rider sweeper. 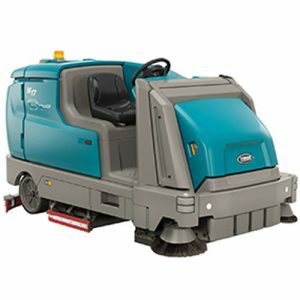 The heavy duty body construction and high quality sweeper components will help reduce your company's maintenance and repair costs, as well as give you an ease of mind knowing you'll be well taken care of with such a great machine. Call today to schedule an appointment for your FREE DEMONSTRATION! The Tennant 800 Industrial Rider Sweeper features a wide cleaning path and large capacity hopper to allow you to cover more ground in less time. The 800 is an extremely durable machine built out of heavy-duty steel and is capable of picking up anything from cement dust to heavy debris. Easy access to all sweeper controls and a spacious cab makes for a comfortable operator experience. The multi-level dump hopper can empty debris into containers as high as 6 ft., allowing for more continuous cleaning time. The versatile M17 battery sweeper- scrubber delivers exceptional sweeping and scrubbing performance, as well as provides health and safety benefits. Up to 67 inch cleaning width and 115 gallon solution tank helps cut time and money. 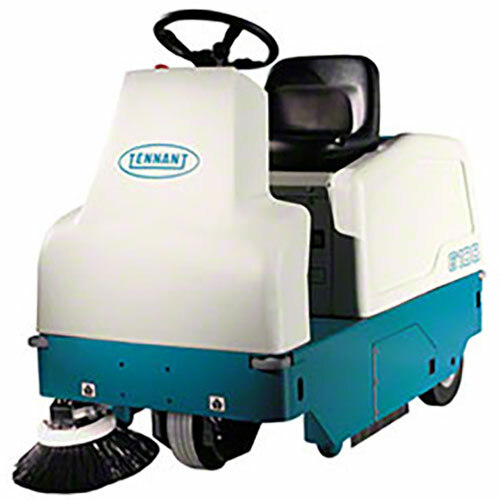 Enhance your facility's image with effective sweeping and scrubbing capabilities that deliver consistent results in even the toughest environments with the Tennant M17. 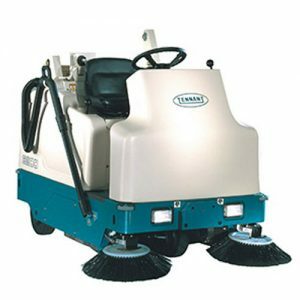 The Tennant M20 is an integrated sweeper-scrubber that features special designs to maximize productivity and delivers cleaning performance with impressive results. Whether you're cleaning a wet or dry surface, the M20 is capable of cleaning any mess up in just one pass. This machine allows for an increase in visibility with its cab- forward design, open sightlines, and steering -wheel-mounted controls. Call today to schedule a FREE DEMONSTRATION! 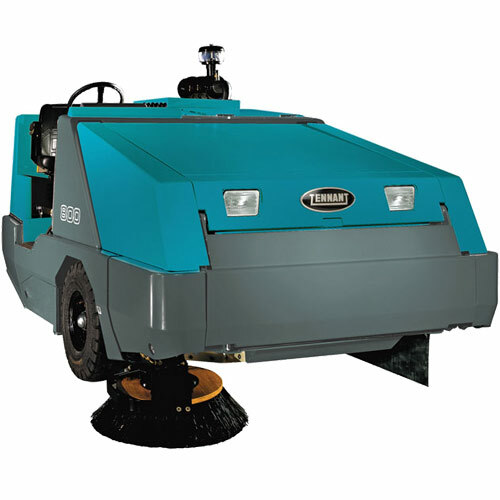 The Tennant M30 is a large integrated sweeper-scrubber that provides exceptional cleaning performance. The M30 features FloorSmart® integrated cleaning system technology that allows the operator to effectively clean floors – wet or dry – in just one pass. The ec-H2O™ technology uses up to 70% less water, allowing you to clean up to 3x longer on a single tank of water. Maximize your productivity while providing the solutions for a cleaner work environment with the Tennant M30- all at the same time. The Tennant S10 Walk-Behind Sweeper is capable of squeezing into tight spaces and sweep with exceptional performance in the harshest environments. 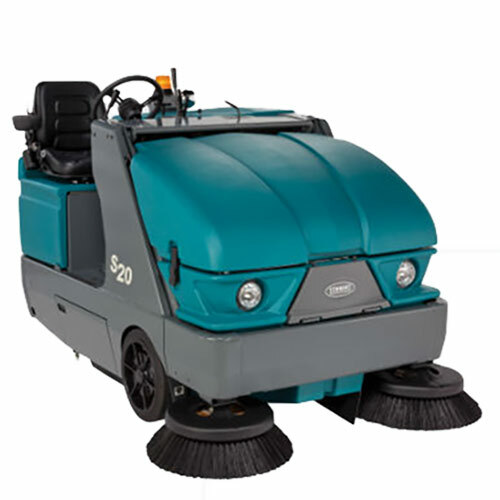 The S10 features one of the largest hoppers in any walk behind sweeper- resulting in increased cleaning run time. Capable of capturing dust particles as small as 3 microns, the S10 helps to protect your employees and facilities from potentially harmful dust. Call today to schedule a FREE DEMONSTRATION! 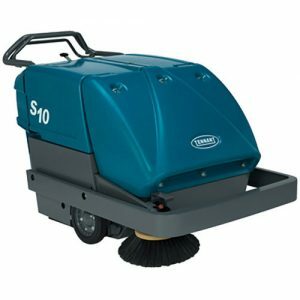 The Tennant S20 is a compact mid-sized rider sweeper that is capable of tackling any job- indoor or outdoor. The S20 features the SweepMax™ dust control system that will help improve indoor air quality while allowing you to sweep longer. The simple operation controls provided on this sweeper reduces the need for exstensive operator training and allows for an easy operating experience. Maintenance is made easy with the InstantAccess™ features on the machine- allowing for quick access to many different parts of the machine without tools. The Tennant S3 Walk-Behind Sweeper features the TwinMax Sweeping Technology that allows for you to efficiently clean your floors in a single pass. 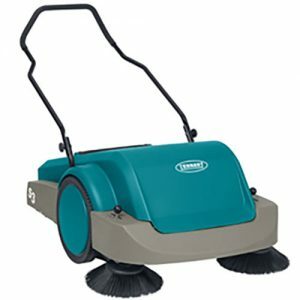 Whether you’re sweeping indoors or outdoors, the Tennant S3 is capable of capturing small or large debris with its dual sided brushes that cleans up to a 34″ path. This manual operating sweeper has a flexible design and is a perfect option for noise- sensitive environments.